Dog Tags are one of the essentials in the Army of USA. During recent years, people used it as an accessory. Now, it is viewed as a very generous promotional gift. A Dog Tag symbolizes honor and courage in the Army of United States of America. Not only so, it also represents a unique identity. In addition, every dog tag can be customized with a unique shape, material, color and a message on it! 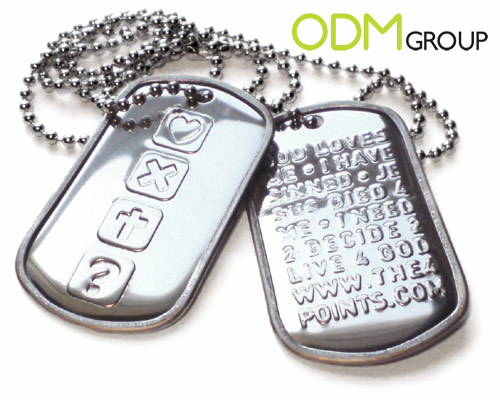 If you require a promotional gift that promotes your firm’s brand image, a Dog Tag would be the perfect choice. ‘Be unique, be you’ – What other promotional gifts can offer such benefits?